LIC Bonus Rates 2017-2018 | Bonus Rate Charts-old and new plans. Life Insurance Corporation of India (LIC), the largest insurer, and the only public sector life insurance company in India has recently declared the bonus rates for the valuation period from 1st April, 2016 to 31st March, 2017. Bonus rates are the rates at which life insurance companies provide additional returns to the traditional policy holders. So it is always advisable to track the bonus rates declared by the company. LIC has declared bonus rates for the financial year 2018 – 2019 as per 2018 March valuation. Click here to open the article on LIC Bonus rates 2018-2019. 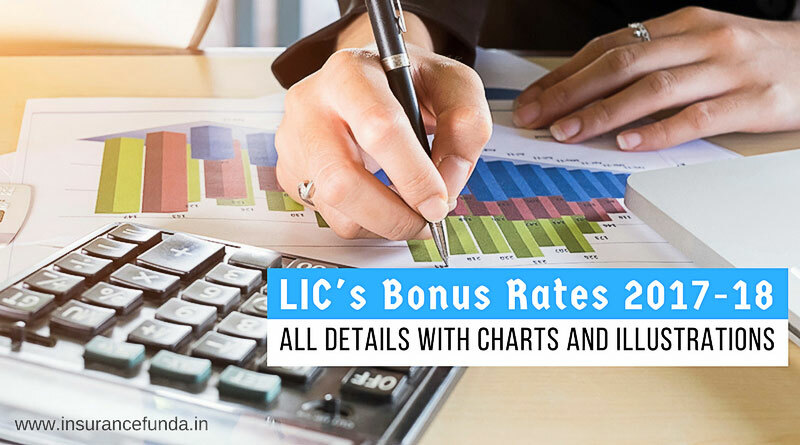 LIC bonus rate charts – How to read? Normal bonus rates are declared as Simple Reversionary Bonuses in LIC. This means the bonus rates will not be compounded. Bonus rates thus declared shall be applicable for 1000 Rs. Sum Assured of the respective plan for the particular year. For example: The bonus rate of New Endowment (Plan – 814) for 21 year term is Rs. 48 per 1000 Sum Assured. Let us assume that the policy is for a Sum Assured of 10,00,000. The bonuses thus declared for all the years till the maturity of the policy will be added together at the time of maturity to find the simple reversionary portion of the maturity returns. You can calculate the maturity returns of your policies using Maturity Amount Calculators of LIC policies as per the latest bonus rates. Simple reversionary bonuses are declared every year and are added to the policy account, as and when it is declared. On the other hand, Final Additional Bonus (FAB) is a one time additional bonus which is paid along with maturity of participating policies. Please note that Final Additional Bonus (FAB) is paid only once in the policies, resulting into claim, by maturity or discounted claim (Surrender of policies with one year preceding the date of maturity) or death claim. One thing to note is that the bonus thus accrued to the policy account will become payable only at the time of maturity or the death of the policy holder. If the policy holder decides to surrender the policy in between, only the surrender value of the policy will become payable. Latest bonus rates of new plans (which are open for sale now) of LIC of India is provided here. The bonus rates for the year 2016 – 2017 is also provided to enable comparison. Please Note:– For Jeevan Pragathi (Plan 838), the bonus rate has been increased for term 16-20. The bonus rate chart for withdrawn plants are given here. You may recall that all the insurance plans were withdrawn on 31/12/2013. Plans were restructured and relaunched later from 1/1/2014. One Important point to note is that the bonus rates of Jeevan Nidhi (Plan 169) has been increased for all the four term ranges. Of-late, the financial market in India has been showing a continuous trend of reduction of interest rates. There were several instances of interest rate reductions in the past financial year itself. With this back ground, when we analyse the the declared rates, we can see that previous year bonus rates are maintained in all the policies. Two policies showed a marginal increase in rates also. This is a commendable achievement for India’s largest public sector insurer. Interim bonus rates of LIC- When it is paid. The interim bonus rates for the year 2017-2018 is shown in the chart. Generally the interim bonus rates are same as the normal bonus rates as far as LIC is concerned. Interim bonus rate are applicable to policies in respect of each policy year, entered upon, after 31/03/2017 and result into claims, by death or maturity (including those discounted within one year of maturity) or are surrendered during the period commencing from 01/01/2018 and ending 9 months from the date of next valuation. As we have seen earlier, Final Addition Bonus (FAB) is a one time bonus paid along with final payment of the policy. Final Additional Bonus rates are dependant of certain factors which are often ignored at the time of purchasing an insurance policy. Minimum term required for the eligibility of Final Additional Bonus is 15 years. If you go through the chart given above, you can see that the higher the term, the final additional bonus rates increases dramatically. FAB rates are dependent on Sum Assured of the policy also. For example, the final additional bonus of a 30 year policy, with a minimum sum assured of 2,00,000 or above is Rs. 1100 per Rs.1000 Sum Assured. This is equivalent of 110% of Sum assured. To make it more clear, if the sum assured of the policy is 10,00,000 the final additional bonus will be 11,00,000. The chart given above (LIC Bonus Rates – FAB) is applicable to endowment type of Plans. LIC has divided other plans into various groups based on their nature and separate charts are provided for each group. If you want to know the Final addition bonus rate of a particular policy, it is advisable to refer to the complete circular which is available here. LIC Bonus Rates – Loyalty Addition – when it becomes applicable? Certain plans like Jeevan Shree (151) and Jeevan Saral (165) have a specialised bonus structure. For such plans no simple reversionary bonuses are declared. Instead one time bonus with the name Loyalty Addition (LA) becomes payable for the policy at the time of maturity as per the valuation of the plan. Premium and maturity calculator of LIC policies. LIC’s New Jeevan Anand -A critical review. Absolutely great explanation. Thanks for the time and effort to do this. Very well explained. Is FAB declared every year and do it is chanagable? That is FAB is guaranteed if policy has survived 21 years. FAB is declared every and will change depending on the experiences of corporation. FAB is applicable only to policies maturing in that particular year. LIC is declaring FAB every year and it is available in LIC’s Web site. LIC will give the full bonus amount up to the policy year containing 2018 March and will deduct any outstanding premium in the last policy year. Interim bonus amount is same as declared bonus in the current year. How to Calculate PWB Premium . Premium waiver Benefit (PWB) premium varies from policy to policy and varies based on the number of years covered and the age of the proposer. LIC will provide the PWB chart along with the plan circular. Policy year is connected to the date of commencement of your policy. For example if your policy has commenced on 28/3/2016, then the first policy year is 28/3/2016 to 27/03/2017 and the second policy year will be up to 27/03/2018. I hope it is cleared. 1. In my case the Policy Commencement date was 23rd January 2010 and the death claim was made on 15th March 2018, So, per your statement, the last Policy year is 23rd January 2018 to 23rd March 2019. Is that correct? 2. I paid the last quarterly installment on 23rd January 2018. So, i will get interim bonus as (Bonus rate declared on 31st March 2017 * Sum assured/1000) – (3 * premium amount). Is this right? 3. If the Claim hasn’t been made, how would the bonus be calculated? Want to know what could be the “loyalty addition” one can expect on maturity for New Bima Gold Policy (policy 179) issued in 2007 for 20 years. No where I was able to find this information. Would you be able to help. Thanks. As Loyalty additions for Bima Gold has not yet declared, I am not in a position to give the information. I am not in a position to do any guess works..
Sir, i have a New Jeevan Shree plan 151 and completed 16 years of premium payment period thereby availing full paid up status of policy. Pl inform whether LA and FAB both will be applicable for my policy upon maturity at completion of 25th year (policy term) or such policies do not have provision of any FAB? Also, what can be approx (purely tentative) quantum of LA (or FAB if applicable) can be expected in per 1000 of SA? I have New Jeevan Shree plan 151, premium term 16 yrs, policy term 25 yrs and SA 6Lakh. Is LA and FAB both will be paid at maturity in this? Also, per 1000 of SA, what can be expected as LA and FAB if applicable? Just a rough idea is okay. In Jeevan Shree plan 151, Guaranteed Additions at the rate of Rs 50 Per 1000 SA shall be available for first five years. The policy will participate in the profits of the corporation there after as per the declared bonus rates. Along with this GA and Bonus rates Loyalty additions also become payable as one time benefit at the time of maturity. FAB is not applicable for Jeevan Shree plan. The bonus rate of Jeevan Umang has not been declared yet. It will be declared in the coming year. I want to purchase New endowment policy Table 814 for 35 year’s horizon in my son’s name . He is now 24 years old.What will be the premium amount and what is the maturity amount like Bonus and FAB. Use this link to open the premium and benefit calculator for endowment plan 814. I want to know the bonuses in maturity in jeevan rakshak plan 827..
Hi Neha, For your information, Jeevan Rakshak plan does not have any bonus. It shall have loyalty additions instead of a bonus. Loyalty addition is a one time bonus declared at the time of maturity of the plan. So you will have to wait till 14 years from the date of inception to know the loyalty rate of Jeevan Rakshak plan. Sir..maximum how much Loyalty additions..kindly let me know the last year loyalty additions.. If i buy jeevan umang, ppt 15 years and Sum Assured 650000 , annual premium 53000 around with all texes , how much final additional bonus i would get on my maturity , if i am alive still end of policy. Bcs my one friend told me that you will get approx 50 Lacs on policy maturity as per last year Final additional bonus. Could say me as per last year final additional bonus rate , how much FAB would i get on policy maturity? For Jeevan Umang plan, LIC has declared the bonus rates in the last year. Which was better than the expected rate. But LIC has not declared loyalty addition rates for the scheme so far. Loyalty addition rates will be declared as and when the policy becomes mature only. The only way to get an approximate estimation of loyalty addition rates is to consider the 8% gross investment scenario. Please read this “LIC declares higher than expected bonus rates for Jeevan Umang” article to get more idea about it.